Lord Ashcroft published his latest crop of constituency polls yesterday. They were from a selection of seats in the Tory-Labour battleground, as I previewed at the start of the week. 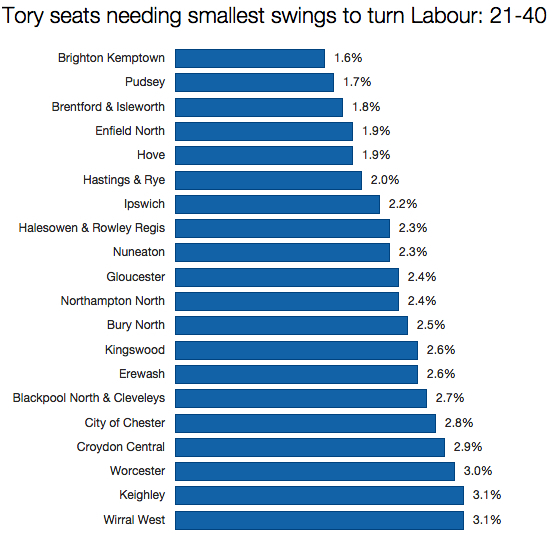 But rather than focus on the tightest races, he ventured a bit further down Labour’s target list and surveyed some of the constituencies needing swings of around 2-3% to change hands. In five of these constituencies, Lord Ashcroft found Labour ahead: the City of Chester, Croydon Central, Halesowen & Rowley Regis, Nuneaton and Wirral West. In the sixth, Worcester, he found the Tories in front. Labour will obviously be cheered by these findings. The size of some of their poll leads is also striking. In Nuneaton it has gone up from three to five points, in Wirral West – my pet bellwether of the election result – it’s increased from one to five points, and in the City of Chester it’s gone up from one to a massive 11 points. This seems somewhat remarkable and quite possibly a bit of a rogue poll. It represents a swing of 8.5%, and if that kind of behaviour was reflected across England and Wales, Labour would have no trouble ending up the largest party, with or without Scotland. The one bit of good news for the Tories is that they have now moved in front in Worcester. Labour were two points ahead here in October, but this has changed into a six-point lead for the Conservatives. Ashcroft visited one constituency outside my top 40 list: Swindon South, which is number 55 on Labour’s target list. Here he found a 4% swing from Tory to Labour: not enough for Labour to take a lead, and which left the seat effectively tied. In addition he polled Southampton Itchen, one of Labour’s most marginal seats and a good candidate for a Tory gain. Here he found Labour eight points ahead: no obvious sign of a Conservative fight back, at least not for now. If we’re to treat these kind of polls with the same gravity accorded to Ashcroft’s Scotland polls – which most of the media has more or less taken as gospel – Labour will have no problem making at least three dozen gains from the Conservatives on 7 May. But as with the Scotland polls, these are not forecasts or predictions of any kind. They merely give us the temperature of opinion at this precise moment. Yes, there are only 50 days until the general election. The real polls don’t open until those 50 days are over, however. And even if Labour do make up to 40 gains from the Conservatives, they could still lose up to 40 seats to the SNP. It seems that Labour are doing relatively better in the marginal seats as compared to the national swing (even excluding Scotland). I feel UKIP is partially responsible. UKIP is mainly taking Labour votes in super-safe Labour seats in Northern England (Paul Nuttall might get 20% in Bootle but that won’t achieve much), whereas it’s taking more Tory votes in Tory-Labour marginals where it could swing the seats. So the votes it takes off the Tories matter more. Yes I agree with Alex. It will be interesting to see if UKIP vote holds up in ConLab marginals which could make some gains for Labour and also whether it will hold up in ConLD marginals where it could mean LD hold on a reduced voteshare because Con lose more votes to UKIP. There now follows an election broadcast on behalf of… how many parties?